I read this some time ago, in almost total ignorance of the context of ‘DB’s story within Gary Trudeau’s long running Doonesbury strip. 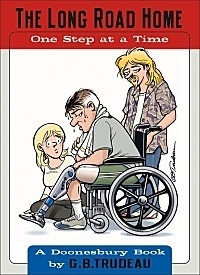 Indeed, I read it in almost total ignorance of Gary Trudeau’s views and vast body of work, as well as the significance of Senator John McCain’s foreword. On top of this, I now realise, I read it in ignorance of the development and background of the DSM4 catagory of PTSD and it’s relavance to stories about soldiers returning from war. I was wondering what to say about it, but couldn’t get it straight in my head. So I put it off. Thank God I did, because when I went to give a paper at Comics: Cultures and Genres at MMU, Roger Sabin and Martin Barker gave a brilliant talk about it (amongst other war-related comics) and put the whole thing into context. So much of what I say here, comes from notes I took at that lecture, and so constitutes Roger and Martin’s thoughts rather than my own. I hope they will publish their talk as a paper. Story synopsis: Former football star and coach Lieutenant DB, a military reservist, gets his left leg blown off by an RPG whilst on patrol in a Humvee outside Fallujah. As he drifts in an out of conciousness he is Medevac’d to a field hospital for resussitation. From the field hospital ward he makes the call home to tell his wife he has lost a leg, quipping that the good news is that he is down to his ideal weight. So begins his journey home, via Landstuhl Regional Medical Center, where he is joined by his wife Boopsie, to Walter Reed Army Medical Center, then to Fisher House and then home, where one gets the feeling that his journey is only just beginning. His stuggle to readjust to life as an ‘amp’ is counterpointed by excellent black humoured gags. He’s an ‘AK’ (above knee) so he gets the ‘cool’ hardware- a C-Leg that costs as much as a lexus. Prior to this story, BD was never shown without a helmet, his football helmet being swapped for a military helmet when he was sent to Iraq. As he is medivac’d from the explosion, his helmet is removed, revealing for the first time his greying short-back-and-sides. The other characters, his daughter included, are transfixed by the sight of his hair. The removal of BD’s helmet, suggested Barker and Sabin, transformed him from a ‘type’ to an individual. Gary Trudeau provided, throughout the Bush years, a liberal critique of the hypocracy he saw as being evident in the administration. He was denounced on the floor of the Senate by Senator John McCain and Trudeau subsequently quoted McCain’s attack as a badge of honour. He also opposed the invasion of Iraq. Barker and Sabin suggested that something happened between 2003 and 2004 which changed Trudeau’s stance somewhat, resulting in McCain’s forewording of The Long Road Home. Nevertheless, his depiction of the injured BD attracted the wrath of Fox News which started a campaign against him for ‘exploiting grief’. This is a darkly funny book, best read, I guess, with some knowledge of Doonesbury and the history of the characters. It is followed by The War Within.